Wrote a bunch of articles for Forbes, Mashable, Inc. Entrepreneur, etc. Write 100+ more articles and blog posts for Forbes, Mashable, Inc., Entrepreneur, etc. Then there’s ongoing stuff that’s never finished. I get 6-7 hours of sleep per night, ideally just over 7. I eat three meals a day with my family, except when I have a lunch appointment. My wife and I have a date each week, I have a date with one of our kids each week, and we have a family night on Monday evenings. I put my kids to bed pretty much every night. What are you talking about, I’m on Facebook all the time! Ha! But seriously, I go to church on Sundays and serve in a volunteer position there. We have people over for lunch or dinner regularly. But no, I’m not out every night at the bar or anything like that. I’m a skater, and I don’t skate as much as I would like to, that’s true. But I do yoga six days a week for a half hour and I run three times a week. There’s more, but you get the idea, I’ve got a lot of stuff going on, but I’m not killing myself to get it all done. I’m not trying to brag. I’m not better than anyone else just because I’m busier or if I get more done than most. I’m not in a race against anyone but myself and the ticking clock that says I may not have more than another 40 years before I walk into the next world. If I stop to compare myself to anyone else once in awhile, I look at what full-time moms do and think “Man, I’ve got it easy.” That’s a reminder to me to not feel sorry for myself when I’m overwhelmed. I look at Gary Vaynerchuk and wonder how in the world he does it all. That’s a reminder to stay humble, and also to check my desires and ask myself “Is that the life I really want?” Answer: No, not exactly, but I want parts of it, and examining how Gary and others who are successful at hustling and getting a lot done teaches me how I can get more done. In sharing how I get stuff done my intent isn’t to say “Look how smart I am, look at how much I’m getting done,” it’s “Here are some of the most useful things I’ve learned from others, and I know they work because I’ve tested them out on myself and here are the results.” I’m just passing along lessons learned in the hope that something may be useful to you, or that perhaps you’ll notice where I can improve and you’ll tell me. If you have any suggestions on how I can do better with managing my time and schedule, I’d LOVE to hear it! If you think I’m involved in too many things and spreading myself too thin you’re probably right. Yes, I’ve read Essentialism by Greg McKeown. When my wife suggested I read it I told her I already had, and she said “I think you need to read it again.” I did. I think I’m applying it pretty well. You should have seen my list before I read it. I’ve also read The Power of Less by Leo Babauta and The ONE Thing by Gary Keller and Jay Papasan. Those are some of my favorite books. I’m working on being more focused, and maybe I’ll get there…or maybe I’ll discover I like being overwhelmed and busy with 50 things at a time. We hear a lot that hustlers don’t just work harder, they work smarter. Too many wannabe hustler focus on the smarter part, and ignore the fact that hustler still work harder. Too many of us have an entitlement mentality, perhaps because our parents told us all the time how smart we are, and somehow we got it into our heads that because we’re smart we deserve stuff without doing any work for them. 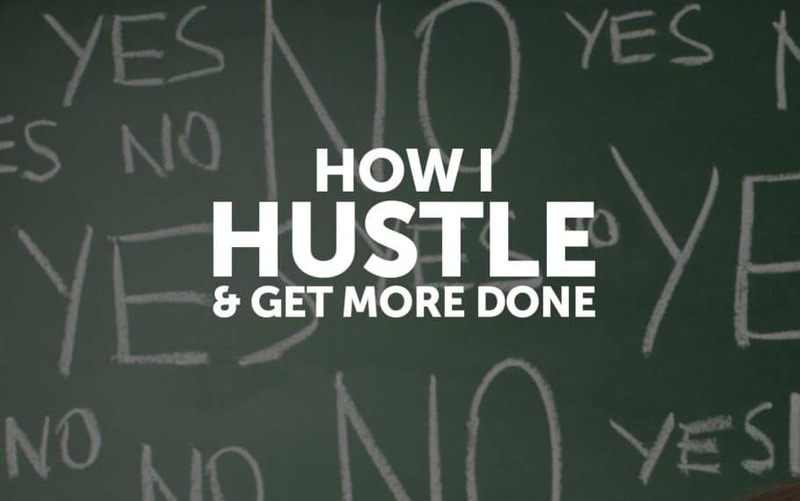 Hustlers get a lot done by working smarter and harder, and that means setting goals, making plans, and having systems to execute those plans and reach your goals. It also means managing time wisely so that it doesn’t slip away. My problem is that I’m not very smart or wise. My strategy has been to copy what other people much smarter than I am have done or are doing, and then modify their systems and habits to meet my circumstances. Call it “The not-so-smart man’s hustle.” What I lack in smarts, I make up for by working hard to learn from the experiences of others, and then I do the other hard work too. I love the idea of time management but have always struggled to make it work for me. It’s appealing to think of having every day planned out to the minute and being able to simply execute that plan. I’ve been able to do this successfully only twice in my life. The first time was from ’94-’96 when I was an LDS missionary in Brazil and we had a set schedule we followed and zero distractions. Every hour was planned out with a single focus. I woke up at 6:30, said prayers, showered, got dressed, ate breakfast, and at 7:00 started studying scripture and our missionary guidebook. At 9:30 am we left the house and worked until 9:30 pm. Each night after we got home we had a set routine and we were in bed by 10:30. One day each week we had “preparation day” or “P-day” when we went to get groceries, did our laundry, wrote letters, and took care of other errands. We had no jobs, no girlfriends, just the same schedule six days a week (with a slight modification on Sundays for church meetings). We got a LOT done, and it was easy. The second time I felt completely in control and on top of was right after my mission for a period of about 8 months. I was attending university and planned out every day and put just as much focus on my studies as I had into being a missionary. Despite a history of lackluster performance as a student (my high school GPA was something around a 2.3) I was able to take 25 college credits in a single semester and got all A’s, except for one A- (which the teacher said he would change to an A if I wanted him to). I worked out every day, ate well, got eight hours of sleep every night, and felt on top of the world. Then I got a job, discovered girls, and the next semester I failed three classes. 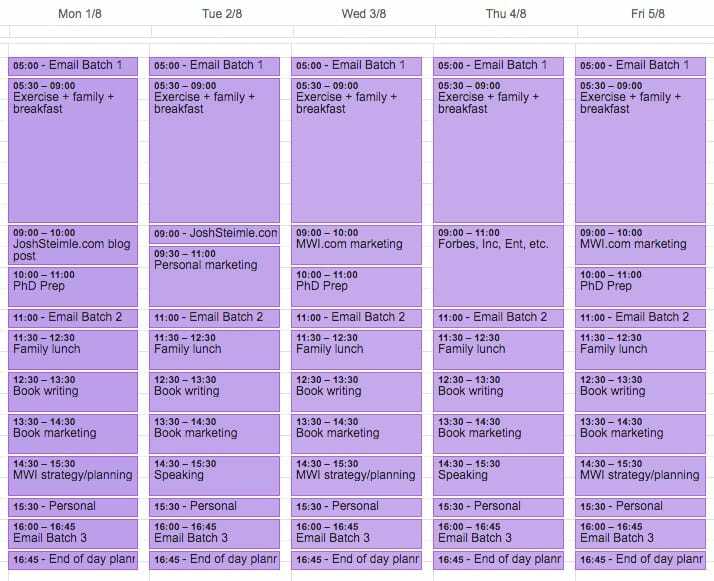 Since then I tried many times to stick to a schedule but it never seemed to work because of interruptions and trade-offs. It’s one thing to manage your time when you’re a 20-year old, single missionary, and it’s quite different when you’re married with small children and running a business. Sometimes our kids go to sleep by 8 pm. Other nights they’re up until midnight and coming out of their room every five minutes to complain about what the other child is doing to them or on them. I’d like to get to bed by 9 pm every night and wake up every morning at 5 am, but even if it weren’t for the kids keeping me up there’s the matter of business events I want to attend, or going out with friends, or maybe my wife and I need to talk about something and we can’t put a time limit on it. The next thing you know we’re getting to bed at 1 am and then it’s hard to wake up four hours later. There are things I’m not 100% in control of that affect my schedule, and there are other things I don’t want to eliminate. So instead of trying to plan everything perfectly, sticking to it 100%, and then when I fail throwing my hands up in the air and saying “Well, that didn’t work!” and going back to managing by inbox, I’ve created a way of working that helps me focus on my goals, work efficiently, and yet still be flexible enough to fit other things in when they come up. In other words, the goal isn’t perfection, it’s improvement. I don’t need to stick to my schedule 100%, I’m happy with 90%. But the truth was that I wasn’t happy with things that way. I figured that was the best I could do, so I better make myself happy about it. But then I read a certain book, made a few small tweaks, and it has made all the difference in the world in terms of my productivity and overall happiness. Go buy this book right now–The Miracle Morning by Hal Elrod. Get your teammate on board. When I was a university student it was my roommate. When I was a missionary it was my companion. Now it’s my wife. Having her on board, waking up at the same time as me, has been huge, perhaps the biggest factor in the success of our current system. Wake up early 99% of the time. When I wake up at 4 am then I feel like I have free time. I can get ahead. If I wake up at 6 am I already feel like I’m behind and have to catch up. Getting up at 4 am means I can resist the temptation to check email first thing and instead do my affirmations, scripture study, and exercise, because hey, I used to get up at 5 or 6 am, so I wasn’t checking my email until that time anyway, and the world didn’t end, right? 6:30-7:00 pm: Reading time with kids. 7:00-7:30 pm: Family prayer, one on one time with kids. 7:30-8:30 pm: Brush teeth, put exercise clothes out for next morning, get ready for bed, talk to my wife. 8:30 pm: Read bedtime affirmations (explained in The Miracle Morning), lights out for us and kids (kids read books or do quiet stuff from 7:30-8:30 on their own). 4:00 am: Wake up, turn alarm off. 4:00-4:15 am: Drink 8 oz water, go to the bathroom, wash hands, then face, brush teeth (The Miracle Morning explains why, just trust me). 4:15-4:30 am: Couple inventory. This is when my wife and I bring up anything that gets in the way of our relationship. We’ve both agreed to not hold back, and to not be offended when the other doesn’t hold back. Review calendar for the day. Discuss anything quick that needs to be discussed about family. 4:30-4:45 am: Individual prayers, affirmations, visualization. 4:45-5:15 am: Yoga and listen to audio version of scriptures. 5:15-5:30 am: Get ready to go running MWF. TThSat I go straight to checking email at this point, or I have phone calls with the US. Sundays I don’t do any exercise, so from 4:30 am on I’m doing family or church stuff. 5:30-7:30ish am, MWF: Go running. Mon is distance, Wed is trails, Fri is speed. I keep it simple. 7:30ish-8:00 am: Shower, listen to Chinese tutorials while showering, dress. 8:00-8:30 am: Family breakfast together, family scripture study. 8:30 work day begins officially. Yes, this means I don’t go out much at night. I prefer to never go out. Not that I don’t like going to startup and other business events, but I love my nighttime and morning routine and how it sets my day off right. When I live this way, I get a LOT more done, and it seems easy. With my morning under control I’m ready to take on big goals. I like big goals. I also like small goals. I also love how James Clear says you should forget about setting goals and create systems, but in the end even James says “I’ve found that goals are good for planning your progress and systems are good for actually making progress.” Whatever terminology you use, the point is that you need a dream, an objective, a destination, otherwise you won’t know what systems to create because you don’t even know where you want to go. I already outlined some of my goals above, the thing I’m going to get done in 2017. Will I get them all done? Maybe, maybe not. I don’t stress too much about it. If I set a big goal to do something, get 25% through it, and realize it’s not the thing I should be focusing on, and that I should really be doing something else, I don’t have much of a problem dropping the one thing and moving to the other. Does that ever get me in trouble? Sure. Sometimes it also gets me out of trouble, but that’s a topic for another blog post. Then, after setting the big goals, I look at my subtasks or systems for attaining each goal. The goal is to produce or work on 9 pieces of content each week (that PhD one ain’t getting done in one day, I can tell you that). In other words I want to submit an article to my column for Entrepreneur Magazine every week. The areas in blue get published under my name. The green areas mean I pitch stories to other writers. Click on it to see it full size, and feel free to copy this for your own use if you want. Some people might find this a mess, but it works for me (except that I need to update it, been kind of swamped the past week though). 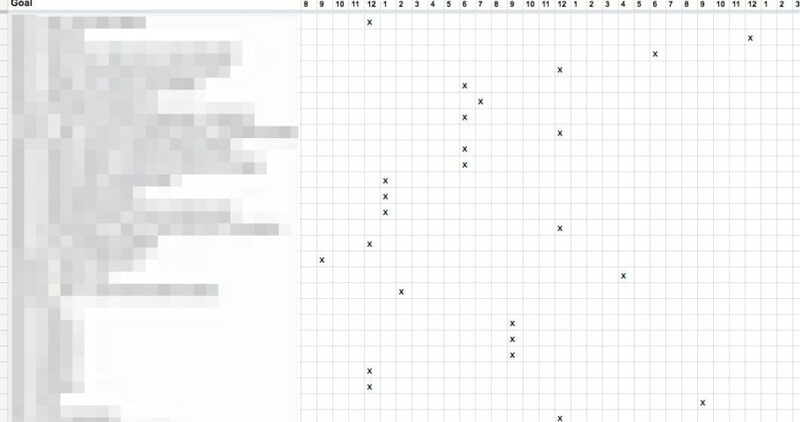 I have other sheets like this for other things I’m working on, like recruiting speakers for the Influence Summit, tracking speaking opportunities, etc. But when I’m really serious about something getting done today, it goes on the calendar. Sure, you can’t plan for everything. Things happen that you can’t anticipate. But it is a whole lot easier to accomplish what matters most when you are proactive and begin with the end in mind. I can’t control everything my kids do, and there are things that will come up that interfere with my ideal week, but that’s ok because I’m not aiming for perfection, I’m only looking to do better than if I didn’t plan at all. My ideal week isn’t a plan so much as a guide. It’s a template for getting things done. Here’s what my ideal work week looks like right now. Actually, it used to look like this, I’ve totally changed it since then and am the process of changing it further, but it still makes the point. You’ll notice some of these are specific, such as the blocks of time dedicated to checking email, while others are general, like “book marketing.” If I’m not sure what is meant by “book marketing” then I’ve got a sheet for it. I may make radical changes to this today, tomorrow, next week, or in a month. It’s purpose is to serve me, not for me to serve it. Checking email first thing in the morning? Despite scores of article like The 1 Thing Super Successful People Never Do In The Early Morning and an actual book called Never Check Email in the Morning I still start my day by checking my email. This is because I live in Hong Kong, and my team in the US is finishing up their day when I start mine. If I respond first thing in my morning this gives them a chance to respond to me before they sign off for their evening. If I don’t respond to the emails they’ve sent me during their day, I’ll have to wait an extra 24 hours to get a response. This process is quick–on my phone I can go through 100-200 emails in a few minutes and divide them into those that are urgent and those that aren’t. Then, following David Allen’s two-minute rule I respond quickly to urgent emails that require a brief response. Then I get on my desktop and respond to urgent emails that require more typing than I can do comfortably on my phone. Once I’ve processed all the urgent email I’m done and I move on to exercise. Yeah, that’s what I used to do. I don’t do that anymore, because I tried it and it didn’t work for me, I didn’t have the discipline to just check urgent email, I would start responding to all sorts of stuff, and then five hours later I’d still be standing there, having completely blown my morning routine. Now I too advocate that you do NOT check email first thing in the morning. The one exception is when I’m supposed to interview someone or be interviewed at 5 am my time and I need to make sure they haven’t canceled or something. I work from home most of the time, which is why “family lunch” shows up every day. While this is my ideal schedule, it doesn’t reflect the realities of life. 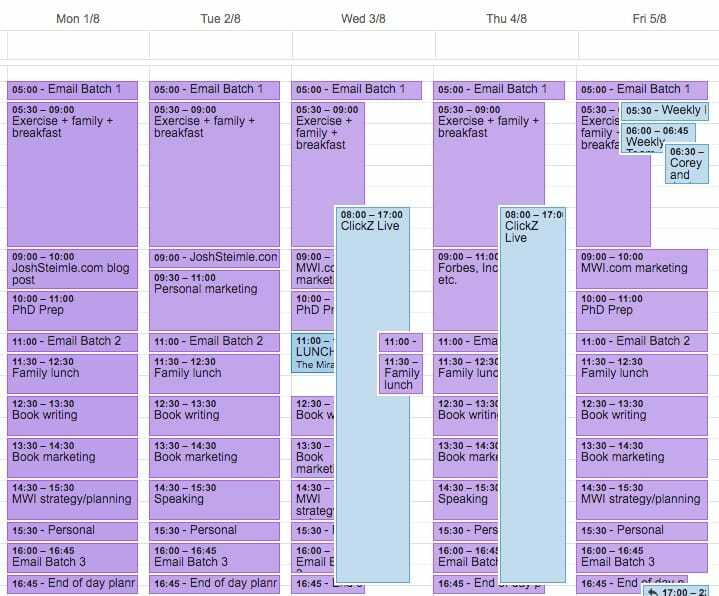 Here’s what my week looks like next week when I add in my real life commitments (in blue). For example, on the week shown here on Wednesday and Thursday I’m attending and speaking at a digital marketing conference. That means I won’t be eating lunch with my family, and I may not have time for many of my other Ideal Week activities. That’s ok–if they’re critical I can move them around to other days, rearranging as needed. I may delete some of my Ideal Week activities, like family lunch and exercise, just to clean things up a bit since I know those things aren’t happening on these days, but I’ll leave the rest as a reminder of what I would like to work on if I have spare time during the conference. 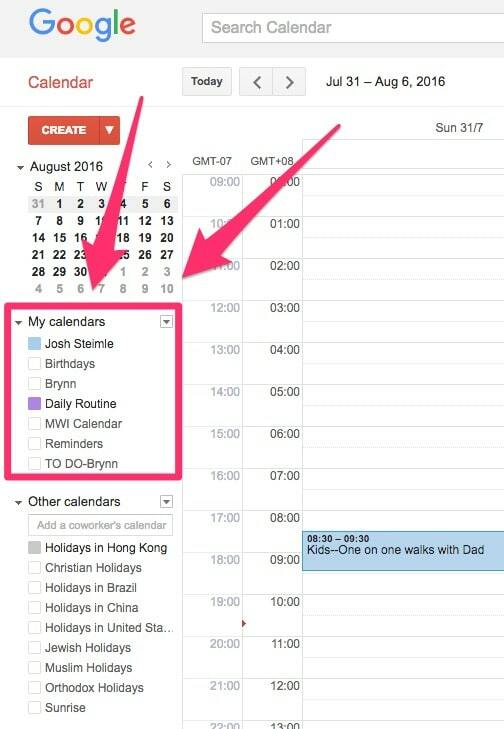 Note: If you’re wondering how I make different colors for different calendar items, I’m using Google Calendar and I set up multiple calendars for different areas of my life and then I can display or not display them using the bar on the side, as shown below. There are two distinct challenges to organizing your life this way; 1) getting everything set up, and 2) sticking to it. It took me several days of pushing aside most of my other work just to get organized. Sticking to your Ideal Week is harder, because there’s no end. This isn’t a temporary change, it’s for the rest of your life until you find a better way to organize and plan. It’s easy to get to the point where you ignore your Ideal Week and push it aside to deal with urgent matters. It’s hard to tell those things that seem so urgent “Not now, you can wait.” But if you stick to your Ideal Week you’ll find that much of it becomes habit, freeing your mind to focus its energy on creative pursuits rather than managing minutiae. Shadow Time. Thank you, thank you Jeff Hill for this concept! Jeff was one of my professors at BYU and I’m sure he taught me lots of great things, but this is the one big thing that has stuck. It’s very simple–where possible and wise, combine things. A lot of people ask me how I read so many books. It’s because I listen to books on double speed using the Audible app while I’m running, commuting, doing odd tasks, etc. For example, today I read most of Robert Cialdini’s Pre-Suasion while I was out on my run. Then I had to walk some stuff over to our new apartment a few blocks away and do some work at the apartment by myself, so I listened to a chunk of Ryan Holiday’s Perennial Seller. It doesn’t end with listening to books. The other day was a work day, but I still managed to spend four hours with my son and get a full day of work in. How? Because I took my son with me. He gets extra time with me, I get extra time with him, and I still got my work done, half of which involved taxi rides anyway. Sure, I could have been checking email or listening to a book during that time, but where possible I look for shadow time opportunities with my kids. Saying “No.” Strategy isn’t deciding what to do, it’s deciding what not to do. I’m a big believer in the power of constraints. If you read The Goal by Eliyahu M. Goldratt you’ll recall his Theory of Constraints which teaches to identify the constraint and restructure the rest of the organization around it. Goldratt was talking about constraints in management and manufacturing. I believe in creating artificial constraints for a better life. For example, I used to work 100 hour weeks, often sleeping at the office, or coming home at 3 am, only to get up a few hours later and go back to work. Then my wife put her foot down and said “No” and so we set a rule that I would get off work no later than 10 pm (I know, it sounds funny now). Then we moved it earlier and earlier until it became 5 pm. We also decided I wouldn’t work Saturdays (Sundays were already verboten because it’s our Sabbath). The strange thing is that when I dropped from working 100 hours a week to 30-40 hours a week, my business was more successful and I began making more money. I don’t say “no” to working more because I have run out of town, I created an artificial constraint, and restructured my life around it, with clear benefits. Rearranging or Removing? I’ve had this problem over the years where I come up with a system, I’ve got everything just right, but then one morning I wake up, there’s an emergency that has to be handled, and the entire day that I have meticulously planned out gets ruined as I enter “default mode” which means management by inbox. Ever happen to you, too? Here’s how I solve this issue. I think about my day as a bunch of blocks, like Legos stacked on top of each other. Only so many blocks can fit into the day. If I want to add a block in, I have to remove a block somewhere else. I can also rearrange blocks. The trick is to resist the temptation to throw them all out. When something comes up at 5 am and interrupts my normal schedule, I look at what I have planned for that 5 am block and ask myself “Am I rearranging or removing?” Maybe I just take what I would normally do at a 5 am, but I do it at 9 am instead. But if that’s not going to work, maybe I have to remove the 5 am block. Regardless, I try to minimize the impact of the new event and not let it get me completely off track. The rest of my plan for the day stays the same. It’s a small tweak in thinking, but thinking about it the right way allows me to keep getting done what I want to get done, rather than what my inbox wants me to get done. One Big Thing. Each day I have “One Big Thing” I commit to get done. If it’s too big to get done in one day, or requires input from others, I commit to get to a certain point with it. And that’s the thing I do first. I usually make sure it’s something I’m avoiding doing. That way I get something big that I’m avoiding out of my way, first thing in the morning, and the rest of the day instead of feeling guilty and focusing on things that aren’t as important, I’m in control. I love this because every day I know I’m going to get at least one big thing done. Q: How do you run a business and have time for all this other stuff? A: My agency, MWI, has 25+ people working in it. I don’t run the day to day details very much, other people who are smarter and more capable than I am do that. I focus on high level strategy and building my personal brand, which generates leads for the company. With Influencer Inc same thing–I have a team of people who help me. Q: But that’s not fair, so you’re not actually getting all this stuff done, other people are! A: Yeah, that’s how successful people become successful–they do the stuff only they can do, and if someone else can do it, then they hire that person to do it. Focus on your strengths, let others do the rest. Richard Branson has 430 companies, how much time do you think he spends each year, on each one? How do you manage your time? Do you have ideas for where I could improve what I’m doing. I’d love to hear!